I loved Enclave, the first book in the Razorland series, because it was an interesting and fresh take at the post-apocalyptic world with a very strong female protagonist and interesting supporting characters (you can find my review here). So I really wanted to like the next two books in the series, I really did. Unfortunately, those books proved to be a huge disappointment, at least for me. Oh, the world-building is excellent. 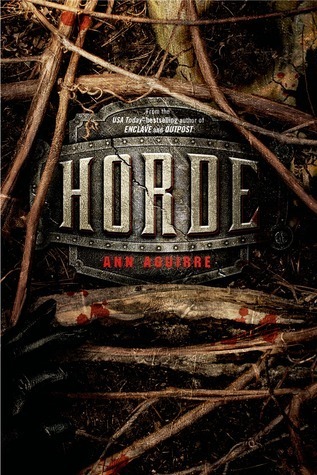 Ann Aguirre does a wonderful job describing the different settlements and the different ways people chose to survive after the world we knew suddenly ended. The problem is that, at least in my opinion, she stopped listening to her characters somewhere along the way. While they still behave somewhat in character in the beginning of Outpost, most of them are blatantly out of character during Horde. It’s like the author decided to stick to the plan she had formulated way at the beginning of the series and didn’t take into account that her characters changed in the process. She just clobbered them into submission and made them dance to her tune. Well, they danced poorly, that’s all I can say. SPOILERS ALERT!!! READ AT YOUR OWN RISK!!! My biggest disappointment is the evolution of Fade. He was such a strong character in Enclave! I can’t believe that someone who managed to survive in the tunnels on his own for a few months when he was eight years old, and someone who was the best hunter in the Enclave, would just break and fall into pieces after he gets captured. Yes, what he went through was horrible. Yes, he was beaten. Yes, he saw horrible things. But he got out, he survived. Hell, he even managed to walk out of there on his own steam, so he wasn’t beaten that hard. Yet he suddenly transforms into a brooding, self-hating weakling. Even worse, he lashes out on people closest to him because of what happened. Excuse me? This is not the Fade described in such loving details in the previous book and a half. It almost feels like the real Fade died in the Freak camp, and Deuce freed a doppelganger. The whole love story between Deuce and Fade is mishandled in my opinion. Any time Deuce thinks about Fade, she transforms from a tough, rational woman into a doe-eyed simpleton. I get it that she loves him, but fawning over his every move and acting like her brain gets short-circuited every time he is around is so very out of character that it’s not even funny. More than that, this love story turns into a typical YA cliché. 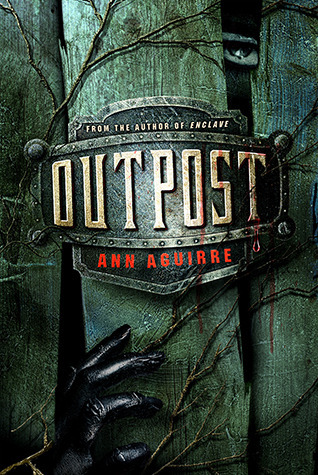 This is sad, because it could have been so much more intense and interesting, had Ann Aguirre just listened to her characters instead of imposing her own vision on them. Thirdly, I am getting really tired of the whole love triangle theme in YA books. It’s been done and overdone. And this love triangle serves to illustrate my point about the author imposing her will on characters. Stalker changes a lot through the books, and for the better. He is still as ruthless, but his develops a conscience, he becomes a decent strong man. In other words, exactly the kind of man that Deuce would fall for if she was acting in character, especially considering the way Fade is behaving… But that doesn’t happen. My final complaint about this series is that Deuce basically becomes a Mary Sue in Horde. I’m sorry, but I don’t believe that a 17 year old girl would be better suited to lead a whole army than a seasoned warrior. No matter how much she had seen and how many Freaks she had killed before. She is a good fighter yes, a good leader of men she is not. Yet, somehow that’s what happens in book three. A young girl leads them all to victory. Sorry, I don’t believe it. And that’s how a series that showed so much promised ended up in such disappointment.